Nothing came up in The Googles, when I sought a true (crunchy) biscotti version of the favorite cake of me, my husband, and my father-in-law (RIP). And it was my husband’s birthday, this past weekend. I like cake more than he does, and we both love biscotti with coffee in the morning, so the search was on. Or rather, the improvisational skills were put to use. Inspired by those talented and creative bakers we see regularly on the Great British Baking Show: I created something new. This recipe is adapted from the terrific chocolate biscotti recipe of David Lebovitz. Enjoy! 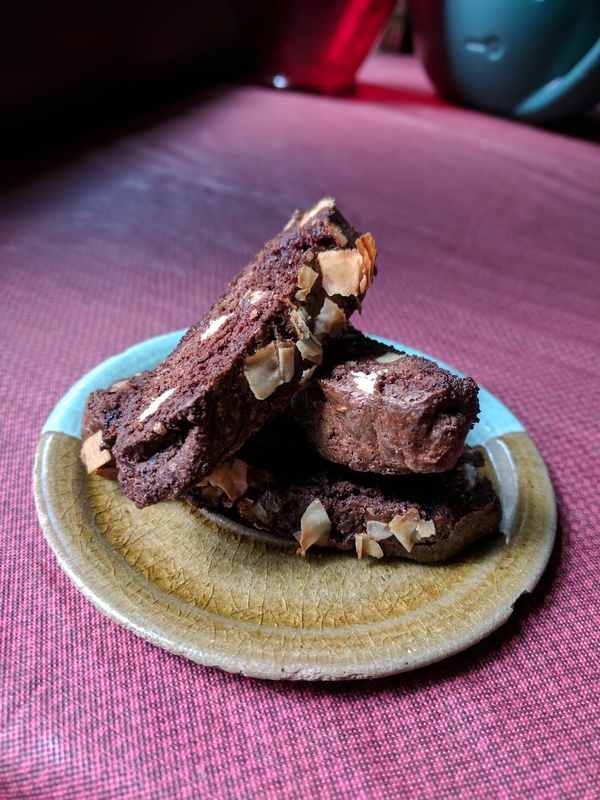 NOTES: pictured above are biscotti with a non-sweetened coconut topping, but I also baked and preferred the texture and flavor achieved with sweetened coconut. Also: the toffee will melt and pool up then harden on the pan next to the logs, where it escapes. It’s okay. And tastes great. In a large bowl, beat together the 3 eggs, sugar, and vanilla extract. Gradually stir in the dry ingredients, then mix in the nuts and the chopped toffee candy until the dough holds together. Line a baking sheet with parchment paper or a silicone mat. Divide the dough in half. With hands moistened with a little water (you may need to re-wet your hands a few times), roll the dough into two logs the length of the baking sheet. Transfer the logs onto the baking sheet, evenly spaced apart. Gently flatten the tops of the logs. Beat the remaining egg and brush the tops of the logs liberally with the egg. (You won’t use it all). Sprinkle the tops with the coconut and bake for 10 minutes, then loosely place a tent of tin foil over the top of both logs, as the coconut browns quickly. Then bake for another 15-20 minutes, until the dough feels firm to the touch. Remove the cookie dough from the oven and cool 30 minutes. On a cutting board, use a large sharp (chef’s) knife (press down swiftly and firmly) to diagonally cut the cookies into 1/2-inches slices. Lay the cookies cut side down on baking sheets and return to the oven for 20 to 30 minutes, until the cookies feel mostly firm.